This book is just wonderful and perfect for a boy or a girl. 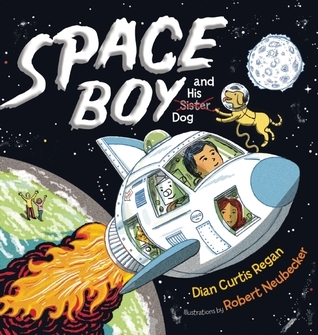 If you notice in the above photo, the title says SPACE BOY AND HIS SISTER DOG. The sister, Posh, makes an appearance in this novel and will make both boys and girls relate to having a sibling. Niko has made a spaceship out of a box and is always looking for an adventure to take his dog, Tag and robot, Radar on. His sister is not invited on these adventures though. While looking for an adventure, Niko notices a sign that says “Lost Cat” so he takes his spaceship to the moon in search of the lost cat. The only problem is that there is a stowaway. Find out if Niko can find the missing cat and will make it back home in time for dinner. The pages are vibrantly drawn with much detail and will keep even the youngest child interested just by looking at the pictures. The pages of the book are a thicker paper which makes it harder for the pages to tear and easier for the child to turn the pages. There is a lot of silliness and imagination in this story. I love books that encourage a child to pretend and be creative and this one does just that. The author has more books planned for Niko and his spaceship. Be sure to keep these books on your radar. This series would make a great gift for your little creative pretender! 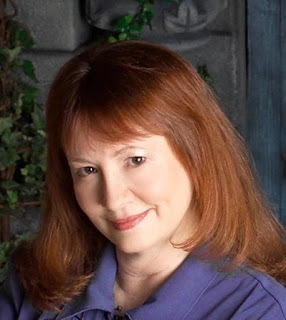 Dian Curtis Regan is the author of many books for young readers. Growing up in Colorado, she spent many a summer in her own backyard making up stories, like Niko. (Her sister appeared in none of them.) Dian has lived in Texas, Oklahoma, Venezuela, and Kansas. Now she is back on Planet Home, Colorado. For more info check out her website, diancurtisregan.com or spaceboybooks.com. Robert Neubecker is an award-winning illustrator. He has drawn for the New York Times among many other publications, for forty years. He lives in Park City, Utah. To find out more about Neubecker and his many books, visit neubecker.com. 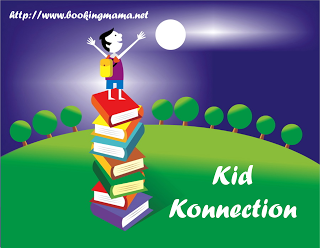 I’ll be linking up this review with other book bloggers on Booking Mama’s Kid Konnection on Saturday. Click HERE to see other great posts about children’s and YA books. Thanks to the publisher for sending a copy of this book for review. This review is my honest opinion. I was not compensated in any way for this review. If you choose to purchase a copy of this book through the above link, I may receive a small commission without you paying cent more for your purchase. Thanks for supporting SincerelyStacie.com reviews. ← Don’t Miss Out on This Deal! Sounds cute. I'll have to check it out with my son (age 5). Oh, I think my boys would love this book! Yay for stronger pages, too! Very nice, Stacie! Thank you so much.